How do you install Encore CS6? This questions pops up all the time – how do you install Encore so you can make Blu-ray and DVD discs when you rent the Creative Cloud version? Essentially you install Premiere Pro CS6, but finding the installer in the Creative Cloud application is not in the place where most people expect it to be. The above video shows you how to install Adobe Encore and also explains how to install ANY of the older versions of the CC applications. Below is essentially the same information in text. Adobe have released CC2015.3, and an update to CC2015.4, which have lots of great new features. However, they also have a few bugs, like any new major update. 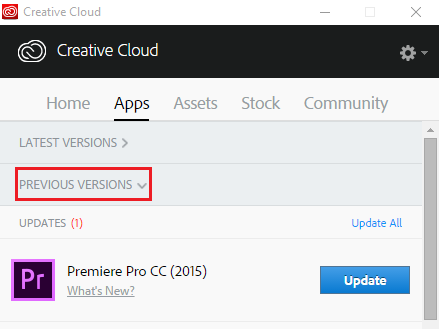 You can always revert back to an earlier version of Premiere Pro through the Creative Cloud app but the procedure is not immediately obvious to many people. Scroll down to the section titled ‘FIND ADDITIONAL APPS’. Click on the ‘All Apps’ drop down menu to the right of the section heading and select ‘VIEW PREVIOUS VERSIONS’. 5. Locate Premiere Pro in the list and click on CC (2015) 9.0. Note that this will install Premiere Pro CC 2015 (9.0) on your computer, not Premiere Pro CC 2015 (9.2). 6. In Premiere Pro, choose Help > Updates….this will update the application to Premiere Pro CC 2015 (9.2), the previous version. Alternatively go to the CC application’s apps tab and click on “previous versions” as shown below. This is the heading people normally assume you have to use to install Previous applications but is, in fact, the heading to update any previous applications you have installed – such as Premiere Pro CC2015.2 mentioned above.